The league could not run without the hard work of many volunteers. Each race meet requires several people available to perform various duties without which, the racing cannot be run. So if you are coming along to watch, bringing a younger racer, or even just taking a week off from the league, why not volunteer, because the league cannot run without you! Below is a list of the positions we need to fill, and a rota of the positions against race meetings to fill for the coming few weeks. 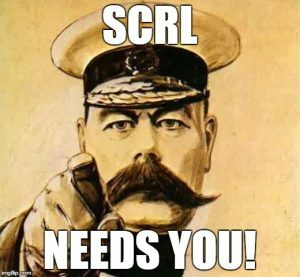 Please drop an email to volunteering@scrl.co.uk if you can volunteer and let them know which slot(s) you can fill. Also let them know if there is one particular task you’d like to do, or any that you would prefer (or simply can’t) do. The following volunteer positions are required every race meeting. Assistant Commissaire 0 1 This person can help with either judging on the final bend to check if people are changing lanes. They can also start races from the other side of the track. Note: You must be an accredited BC commissaire. See here for details. Sign On / Accreditation 2 3 To help with registration and signing on duties at the start of the evening. Sometimes seconded to do gear checks where required. Chief Judge (operates IPAD) 1 1 Helps to verify any close calls on the line or order of finishers. MC 1 1 Announces races. Gives commentary over the P.A. etc. Gate Marshall 1 2 Controls access to the track via the main unlocked gate for the safety of riders and those crossing. Roving Track Perimiter Marshall 2 3 These positions require the marshall to monitor and move around the perimiter of the track to ensure it remains secure (i.e. discourage people who may decide to jump the fence to cross the track etc.). First Aid 1 1 A qualified first-aider is required. Tea Facilities 0 1 Not essential, but makes the event more enjoyable as many people might want to come straight from work and will need a snack, a drink etc. Mechanic 1 1 On hand to perform basic tasks with the loan bikes, swap pedals, change saddle heights, also manage bikes in/out of the lock up if possible.